01 -===- H:\Pet Shop Boys - Elysium (2012) [FLAC]\Disc 1 - Pet Shop Boys - Everything Means Something.flac Extracted successfully Conclusion: this track is CDDA with probability 100% Tempfile successfully deleted. 02 -===- H:\Pet Shop Boys - Elysium (2012) [FLAC]\Disc 1 - Pet Shop Boys - Requiem In Denim And Leopardskin.flac Extracted successfully Conclusion: this track is MPEG with probability 79% Tempfile successfully deleted. 03 -===- H:\Pet Shop Boys - Elysium (2012) [FLAC]\Disc 1 - Pet Shop Boys - Leaving.flac Extracted successfully Conclusion: this track is MPEG with probability 79% Tempfile successfully deleted. 04 -===- H:\Pet Shop Boys - Elysium (2012) [FLAC]\Disc 1 - Pet Shop Boys - Invisible.flac Extracted successfully Conclusion: this track is CDDA with probability 100% Tempfile successfully deleted. 05 -===- H:\Pet Shop Boys - Elysium (2012) [FLAC]\Disc 1 - Pet Shop Boys - Winner.flac Extracted successfully Conclusion: this track is CDDA with probability 100% Tempfile successfully deleted. 06 -===- H:\Pet Shop Boys - Elysium (2012) [FLAC]\Disc 1 - Pet Shop Boys - Your Early Stuff.flac Extracted successfully Conclusion: this track is CDDA with probability 100% Tempfile successfully deleted. 07 -===- H:\Pet Shop Boys - Elysium (2012) [FLAC]\Disc 1 - Pet Shop Boys - A Face Like That.flac Extracted successfully Conclusion: this track is MPEG with probability 100% Tempfile successfully deleted. 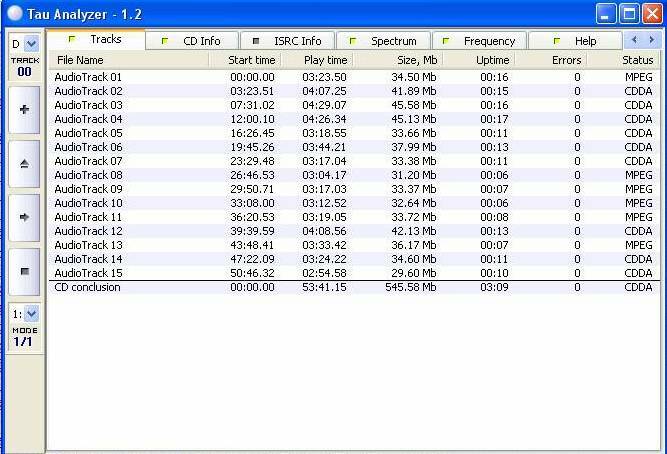 08 -===- H:\Pet Shop Boys - Elysium (2012) [FLAC]\Disc 1 - Pet Shop Boys - Breathing Space.flac Extracted successfully Conclusion: this track is CDDA with probability 100% Tempfile successfully deleted. 09 -===- H:\Pet Shop Boys - Elysium (2012) [FLAC]\Disc 1 - Pet Shop Boys - Ego Music.flac Extracted successfully Conclusion: this track is MPEG with probability 95% Tempfile successfully deleted. 10 -===- H:\Pet Shop Boys - Elysium (2012) [FLAC]\Disc 1 - Pet Shop Boys - Hold On.flac Extracted successfully Conclusion: this track is CDDA with probability 100% Tempfile successfully deleted. 11 -===- H:\Pet Shop Boys - Elysium (2012) [FLAC]\Disc 1 - Pet Shop Boys - Give It A Go.flac Extracted successfully Conclusion: this track is CDDA with probability 100% Tempfile successfully deleted. 12 -===- H:\Pet Shop Boys - Elysium (2012) [FLAC]\Disc 1 - Pet Shop Boys - Memory Of The Future.flac Extracted successfully Conclusion: this track is MPEG with probability 95% Tempfile successfully deleted. Вообще говоря, Тау известен своей косячностью в определении mpeg. И наоборот. Если показывает CDDA это ещё ничего не значит. Тау это программа, от которой отвернулись все аудиофилы. Ну и какой прогой тогда проверить? У Tau Analyzer без сомнения бывают "перегибы", но когда он показывает что MPEG with probability 79% или более то тут уж точно не стоит сомневаться. По мимо Tau Analyzer я так же использую Audiocheker и вполне доволен результатами. Ни для кого не секрет что в связи со значительным спадом спроса на компакт-диски качество их производства так же упало, никто больше не заморачивается над достойным мастерингом. Вы в курсе что lossy в домашних условиях Вы в настоящий lossless никак не превратите? То есть можно пере конвертировать и во флак и в вэйв, но определятся файл будет всё равно как lossy.